The weather has played havoc on my plans to go out. Yesterday, I mentioned cancelling my day trip to First Event because of the weather. Other plans have met similar fates. I drove to a very nice Chinese restaurant in the next town. It was about one-quarter full of customers. No one paid me any mind (that I noticed). I assumed the she was aware I was a male en femme, so I thought nothing about handing her my driver's license. What a great story and a fitting affirmation of your feminine aura. Nice story. An outing like that makes it worth battling the elements. How awesome is that? I love experiences like that! By the way, where did today's "the femulated" , with the boy and girl, come from? Also do you still have the collection of the femulated still posted on a page somewhere? Wow, what a great experience! You're all Woman! M (formerly Audrey) --- Sorry, but I don't recall the source of today's "The Femulated" image. Good news is that I am working on a new "The Femulated" archive page that should be ready to "go live" in a few weeks. That is fantastic! Very encouraging to hear! I have to get to a Fashion Bug, it seems!! 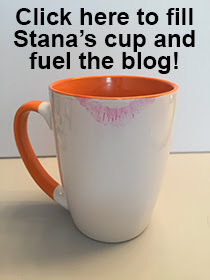 Lucky girl, Stana, and I hope you enjoy many more days like that!